Originally released as a documentary in 2008. Subtitle taken from disc label. Official Selection, Cannes Film Festival (Critics' Week 2008). 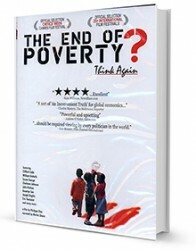 A companion guide for this film, "Why Global Poverty?" by Clifford W. Cobb and Philippe Diaz published by Robert Schalkenbach Foundation and Cinema Libre Studio (2009) catalogued separately. Explains how global poverty began with military conquest, slavery, and colonization that resulted in the seizure of land, minerals, and forced labor. Today's financial crisis is a direct consequence of these unchallenged policies that have lasted centuries. Features expert insights from Nobel Prize winners, acclaimed authors, university professors, government ministers, and the leaders of social movements.